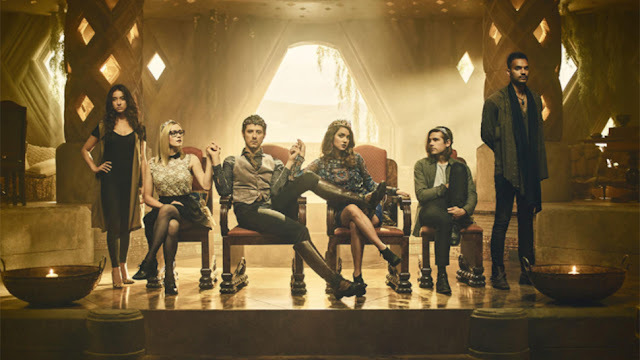 Fangs For The Fantasy: The Magicians, season 3, Episode 13: Will You Play with Me? The Magicians, season 3, Episode 13: Will You Play with Me? This comes from Quentin reciting the book with Elliot and Margot hectoring. Because they always hector. It’s what they do. They now plan to reach that castle, with Kady and Alice reminding us that the Library is still a threat having their own insidious agenda. She has a really good goodbye scene with Quentin - full of their platonic love - and she charges him with enough magic for one spell. Elliot is happy for her. Margot… more practical and very Margot. They continue to look for the Castle at the End of the World without Julia and Josh hits on finding the architect which through research, examining the book and brainstorming they conclude is Calypso, a powerful nymph and is now CEO of an app company (creating a “new form of prison” in freemium games). She also points them to the direction of the castle - in Fillory, the underside. To study the castle Penny volunteers to travel in but, surprisingly, Margot nixes that idea - they already have enough Penny blood on their hands. Instead Quentin uses his oneshot spell to enter the knight’s dreams. She is Ora and explains she’s the last guardian, everyone else is dead to the monster and she’s terrified of letting anyone else in which could compromise the security of the place. Fenn is in Fillory acting as High King, with the Fairy Queen stepping in to offer advice which Fenn certainly doesn’t welcome. But she’s there because fairies are being hunted - the Library and Irene McCallister are hunting fairies for their siphon plan. Fenn lures them into a trap - and the Fairy Queen decides to make a deal to protect her people. She blames herself for breaking the last deal that left them vulnerable - and visible I guess. So she offers another, unbreakable, deal: she will give herself to Irene/the Library in exchange for a promise that no fairies will ever be hunted by anyone, ever. Irene is eager to accept. Personally I wonder just how much they can really guarantee that NO-ONE will ever hunt a fairy… and what the consequences are when it will break. But the main star here is the fairy queen’s nobility and sacrifice for her people, moving even Fenn to tears for her enemy. It also means the Library now has the magic for their siphon. And more, they’ve made a deal with Henry for nefarious purpose. Remember, this is the Alice niffin that killed a creature’s children because they made pretty lights. She says goodbye to Quentin because he is the one he truly loved and will now forget. Except Elliot shoots Nameless with the god-killing-bullet because he has no intention of losing his best friend. They all think it’s defeated but we clearly see mist from the Nameless’s body enter Alice - and we’ve definitely seen possessing creatures before. But the next setback hits - Alice destroys the keys with stolen fairy magic. She has decided no-one should be allowed magic. That humanity cannot handle it. As Elliot points out, she means SHE cannot handle it. And Julia arrives, pulled by his despair. She bestows some godly wisdom on Alice: she’s made the wrong choice and one day will know. Then magics her out of the way so she can reforge the keys. I have to say rarely have I seen a turnaround like this. It’s no surprise that we were Not Impressed with the multiple issues that the first two seasons of Magicians had. It was a disaster - but this season? This season has turned so much around, not just managing not to repeat the constant issues of the first two seasons, but vastly elevating so many of the characters and the storyline so excellently. This went from a show that constantly made me cringe to a show that I genuinely looked forward to. Harriet, an excellent action character who is Deaf is so rare on television - and her POV on Six Short Stories of Magic was great. I just really hope she isn’t actually dead. MARGOT. High Queen Margot, and never has a woman deserved the title more. After being completely ruined repeatedly over and over and over in this season, seeing her finally get the title she has so perfectly deserved for so very long. ALL HAIL HER MAJESTY THE QUEEN!